If you have recently been feeling negative effects from wearing your toric contact lenses, such as itchiness or dryness, you may want to consider changing to a different brand. One possibility is Biofinity Toric contact lenses, a brand from CooperVision that beats its competition for wearing comfort in a published study. These lenses can be used either for daily wear or alternatively for up to six nights of continuous wear. The material used for constructing your lenses can be make-or-break when it comes to how good they feel and how well they perform. Biofinity Toric lenses are made of a substance called comfilcon A, which allows a very large amount of oxygen to be transmitted through it and directly to the eye. This matters a lot when it comes to your eye’s good health, and also contributes to helping your lenses feel good all day long. The comfilcon A material is also treated by a special process that CooperVision calls Aquaform. This technology takes the water-loving properties of the lens and jacks it up by creating hydrogen bonds with water molecules. These bonds draw the water into the lens, keeping them wet for a longer period and helping you get that soft comfortable wearing experience you are looking for. The lenses also feature ease of handling. If you’ve ever fumbled with lenses that are hard to find and manipulate, you’ll be glad that these lenses come with a slightly blue dye that makes handling them a snap. The dye is invisible, however, whenever you are wearing the lenses so there is no need to be concerned about that. CooperVision is so confident in its ability to deliver a superb wearing experience with these lenses that it conducted a patient study comparing the preference of patients between Biofinity Toric and its leading competitor Acuvue Oasys for Astigmatism. The study rated patient preference on a variety of factors. The results of the study were striking. 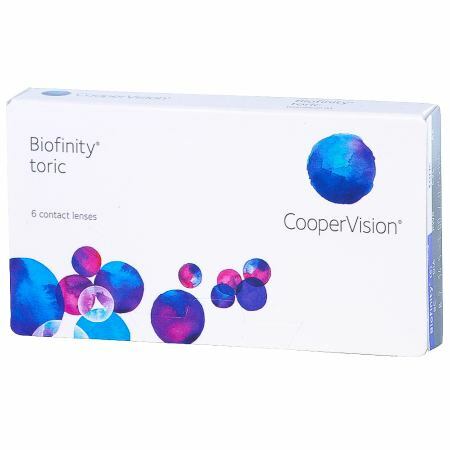 CooperVision reports that 79% of the patients studied preferred Biofinity Toric lenses overall, as compared to the competitor. It also discovered that 81% of participants rated Biofinity Toric higher for both end-of-day comfort level and ease of use. These lenses tend to be used on a daily wear basis, with removal every evening for cleaning and renewal. However, due to their oxygen permeability properties they can also be used by some individuals for up to seven days of nonstop wear. If you are considering this use for your lenses it is very important you speak with your vision care provider and follow his or her advice. While many people can tolerate extended wear just fine, some people cannot due to medical needs specific to them. Don’t take a chance with your eye sight, and make sure your eye doctor agrees with the way you want to use the lenses. To summarize, Biofinity Toric are lenses that are proven by research to deliver maximum wearing comfort and visual sharpness. Whatever may be important to you–ease of handling, high oxygen transmission, high moisture retention for superior wearing comfort, or a combination of these things you are likely to enjoy wearing a pair of these lenses. If you’re tired of your current brand and are looking for a much fresher feeling from your lenses, ask your vision care provider about these lenses and try them today. There is a battle going on in the heart of business: one that might have escaped the attention of the vast majority of people. However if you have short or long eyesight and rely on contacts then it affects you profoundly. The Acuvue contact lens has long been regarded as one of the leading names in the sector. Its use of the ground breaking silicon hydrogel greatly enhanced wearabilty. However, the rest didn’t waste much time catching up and these days it can be difficult to make yourself heard. Before we begin we need to determine the playing field. Silicon hydrogel represents the biggest step forward in contact lens technology in living memory. It makes it possible to continuously wear contacts for a protracted period of time. Products offer wear time of between two weeks and a month. For anyone who was worried about the possibility of drifting off to sleep without taking them out, that is a big relief. The technology works by allowing more oxygen to reach the eye. Almost all the leading contenders boast a transmission rate in the region of 98 per cent. In effect that’s more or less natural levels. The material is easily wettable meaning eyes do not dry out. The result: less irritation, and a lower chance of infection. The Acuvue contact lens technology was one of the best and earliest players in the market. It has a range of leading products that captured the hearts of wearers. However others were quick to join in. In fact there are so many out there now, that it can feel difficult making a judgment call. Bausch & Lomb’s Purevision and Coopervision’s Biofinity all make outstanding claims of breathability and performance. Likewise others swear by Ciba Vision’s Air Optix Aqua range. Here’s the problem for consumers. How do you tell the difference between them? What makes an Acuvue contact lens better than Ciba Vision’s or vice versa? They are not helped by the discrepancy in price. Depending where you buy the product you can expect to pay between 20 and 50 pounds. When both products make the same claims that sound a little strange. However, most of that can be put down to the retail outlet. There is a vast difference between buying online or in-store. For example, the best Acuvue contact lens can be discounted as much as half price if you shop online. It makes your purchasing choice rather difficult, but with good research and plenty of comparison you can find something that works for you. Original dated sales receipt with eligible lens purchase(s) and date circled. Original dated eye exam receipt with eye exam and date circled. TWO original end panels with prescription information from the boxes acquired. If you wear a different type of lens in each eye, please submit one end panel from each type.